Canned brussels sprouts count as one of your 5-A-DAY and chestnuts come straight from the can! 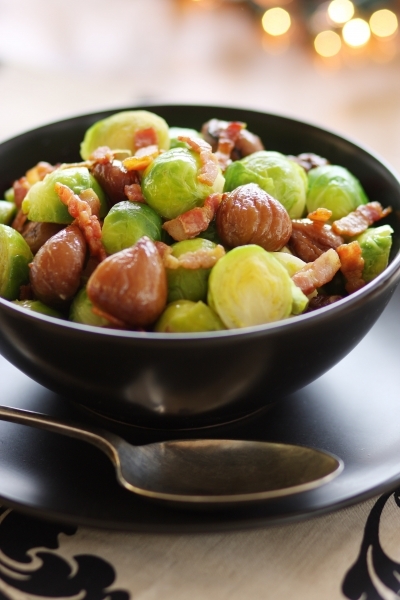 This dish, with sprouts and chestnuts is absolutely packed with festive flavour. Canned chestnuts need no preparation before cooking, so this meal takes just minutes to make. 1. Plunge the Brussels sprouts into a pan of boiling water and boil for two minutes. 2. Drain well and refresh the sprouts under cold running water, then drain again. 3. Heat the butter and oil in a deep-sided frying pan or wok. 4. Add the bacon and fry until crispy, then add the garlic and cook for a few seconds. 5. Add the sprouts and chestnuts and stir-fry until all the ingredients are heated through.